Does anyone build copies of the Sunn 200S cabinet (2X15), circa 1969 without speakers. And if so what kind of cabbage would it take to do so. Right now I'm building a pair of the Sunn 2 x 15 cabs that came with the 67/68 Sunn Sentura II amp. The design is the same used for the Sunn 230-B-60 amp ( 36h x 24w x 11.75d) and with the offset 15" JBL's. [ Note: I'm using JBL K-130's instead of D-130's]. If you are interested, pleas let me know. When I'm finished with my cabs I'll try to estimate the cost of doing the 200S bass bottom. Do you want the speaker baffle grilled, or do you wish to do it yourself. You will have to tell me what type of grill cloth and vinyl covering you want. I'll tell you right now that the Sunn style vinyl is no longer available. I use a pebble grained vinyl, and a black/white/silver grill cloth that I get from Mojo Musical supply. I used 17mm ( scant 3/4" ) 11 ply birch plywood with 3/4" x 1" custom cut clear pine rails for mounting the baffle and back. The cabinet is assembled with full corner cleats that are cross screwed and glued with high strength wood glue for strength. The mounting rails are also glued and screwed for strength. I use a 2" caster that is almost identical to the one's used by Sunn and are mounted with T-nuts and insert Nuts. I believe that there is a drawing of the 200s cabinet on Sunn Shack I. The 200S cabinet was a front mounted bass reflex cabinet. I will also need to know the type of speaker that you intend to use and it's dimentions. Some 15" bass speakers are deeper that the D or K series JBL's. If you use anything other than a JBL D or K 140, the horn of the bass reflex may need to be altered to accomodate the magnet of the speaker. 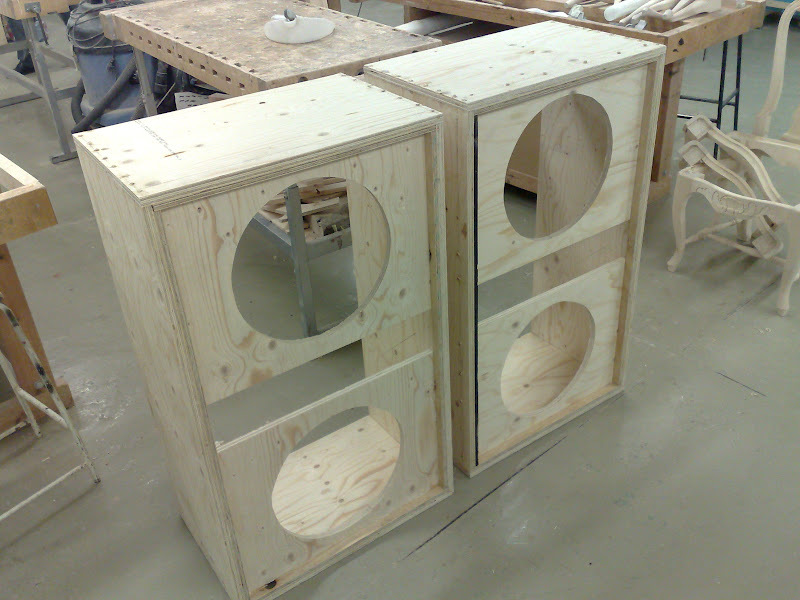 Forum member Spliffpfunk (Bill) was building clones in a cabinet shop a couple of years ago. He hasn't posted in a while, but if you can reach him I'm sure he has the whole rundown on costs, and may even be able to build one for you. As I remember, at the time his pricing was very reasonable. Right now I'm building a pair of the Sunn 2 x 15 cabs that came with the 67/68 Sunn Sentura II amp. The design is the same used for the Sunn 230-B-60 amp ( 36h x 24w x 11.75d) and with the offset 15" JBL's. [ Note: I'm using JBL K-130's instead of D-130's]. So the cabs are different than the dimensions shown in the '68 catalog posted here? I've run into few anomalies in the past, is this another one? If so, maybe you could make a notation on the mega catalog thread! RE: Sunn tolex......Angela Instruments in Maryland carries Fender-era Sunn tolex. Probably the closest thing you'll find to the original tolex. He has an eBay store or send him an e-mail via his website. Yes, the cabs that came with the 1968 Sentura II were bigger than the cabs that came with the 1967 model. The cabinets that I'm building are based on the 1967 Sentura II speaker cabs. They are the shorter cabs ( 24w x 36h x 11.5d ) with the 15's offset from the verticle center - the top speaker towards the right corner and the bottom speaker to the left corner. The 1968 model Sentura II came with the larger sized cabinet - the same size as was used with the 200s, 100s and others ( 24w x 42h x 15d ). The 1968 Sentura I still used the smaller cab but with only one 15" speaker. My cabs are made of 11 ply birch plywood. I decided to build mine 11.75" deep instead of the original depth of 11.5". That gives me a little over 190 more cubic inches of internal volume. Im using JBL K-130's . The K's are rated at 25W more music powerthat the D's. I'm still trying to figure out how to post pictures to this site. I'd like to post pics of the cabs and amp when I get done. Thanks for the info on Angelas Instruments. The largest piece that they can get ot me is 72" long ( 6 feet ). I use a one piece vinyl wrap when covering my cabs so that there is only one seam - and that's on the bottom...so with a 24 x 36 cab, I need a piece 10' long - plus a couple of extra inches for an overlap when I cut the seam. I'm starting my own bass guitar cabinet project. I haven't mabe up my mind about what to make, two 200S size cabinets or one 2000S cab. What do you think? I would like to have the possibility of using one small cab and hook up another when needed. But then if I find that a single cab is too little, I will be using two cabs all the time. Would it be a good idea to just go ahead and build the 2000S? (Conrad's "dream measurements", 5" high, 3-3 1/2" deep and 9" baffle) ? Well. I have made up my mind. I'm building two 200S size cabinets. Does anyone know how thick is the board where speakers are mounted on? Is it 3/4" or 1/2" ? The speaker baffles are 3/4". I would use a good grade of birch plywood for strength. I'm almost finished with a pair of copies of the old Sunn 230-B / 67 Sentura II 2 x 15 cabs, and I used 11 ply Baltic birch from Lowes. It's really good stuff for cabs. There's one on Ebay right now. Buy it now price of $499.00 It has 2 JBL D-140's like to original. Could be a late 68 as it has the Fender style grill. The cabs look fantastic. What kind of ply wood are you using - Pine? How many plys and what thickness. Thanks. It's pine and/or spruce. Not sure actually. It's intended for floor making. Â½-price compared to birch. Lots of knots and fills. 7-ply 18mm really close to 3/4". The port peaces will be 12mm birch.